First of all, I have to say that I would have expected a conference about tackling disability poverty to have included some claimants who actually experience disability poverty however by charging unwaged people £10 to attend this, in spite of the fact that Disability Alliance got the venue free, claimants were by and large excluded from discussions about how to tackle disability poverty. There were a number of further access issues for disabled people too no blue badge parking nearby, no accessible tube stations nearby, a start time that was so early people couldn’t use their freedom passes on busses and anyone coming from outside London had to pay peak rate fares. Several disabled claimants tried to get into the event on the day but were refused entry even though they offered to pay. I was on the list though so was able to get into the conference. Access inside could have been much better too, and there was no dedicated accessible toilets and no space to sit anywhere other than right at the back if you were a wheelchair user. The vast majority of those present weren’t disabled people but professionals who speak for us. Of those disabled people who were there most expressed grave concerns about the nature and organisation of the new organisation DRUK – Disability Rights UK which will consist of an amalgamation of NCIL, RADAR and Disability Alliance. 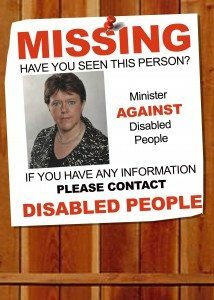 ATOS doctors gave an unconvincing talk about how nice ATOS really are, and then we were treated to a fleeting visit from Maria Miller, the minister for disabled people. There were attempts to stagemanage this part of the programme and Liz Sayce looked decidedly uncomfortable at some of the questions us more ungrateful disabled people asked. 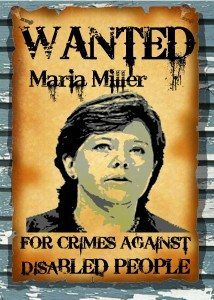 Miller spouted the usual Condem rhetoric about how much better off disabled people will be with Universal Credit, with no care and support funding, no ILF and how grateful we should all be for all the extra money the Condems have put into disability related matters. You can listen to her below if you can bear to. These videos have now been put up by Disability Alliance has been edited to exclude some disabled claimants calling her a “murderer” as she left and has cut out my response to her claims that disabled people need not be afraid of change when I said it wasn’t change people were afraid of it was being trapped in their own homes with no care funding, and another person saying people were afraid of being pushed further into poverty.